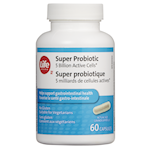 A probiotic formula with a balanced blend of 6 billion friendly bacteria strains, ideal for general use by everyone 6 years and older. 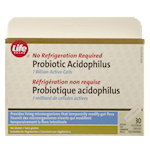 This Life Brand product is a hypo-allergenic, super strength, non-dairy formula. No refrigeration is required. 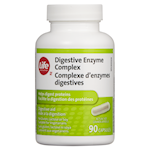 Provides living microorganisms that temporarily modify gut flora. 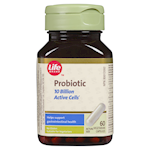 Probiotics that temporarily modify gut flora. Could promote favorable gut flora. This product contains 2.2 calories and <5 mg of sodium per capsule. No gluten, sulphites, yeast, preservatives, artificial flavours or colours. Suitable for Vegetarians. 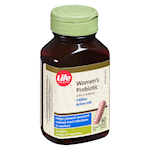 Adults: Take 3 capsules daily with meals or as directed by a health care practitioner. Take at least 2 – 3 hours before or after antibiotics. Children 6 years & older: Take 1 capsule daily with a meal or as directed by your health care practitioner. For young children, open capsule and mix the contents with liquid or food. Take 2-3 hours before or after antibiotics. Keep out of reach of children.Discontinue use and consult a health care practitioner if symptoms of digestive upset (e.g. diarrhea) occur, worsen, or persist beyond 3 days. Consult a health care practitioner prior to use if you have nausea, fever, vomiting, bloody diarrhea or severe abdominal pain. 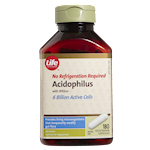 Do not use if you have an immune compromised condition (e.g. AIDS, lymphoma, patients undergoing long-term corticosteroid treatment).